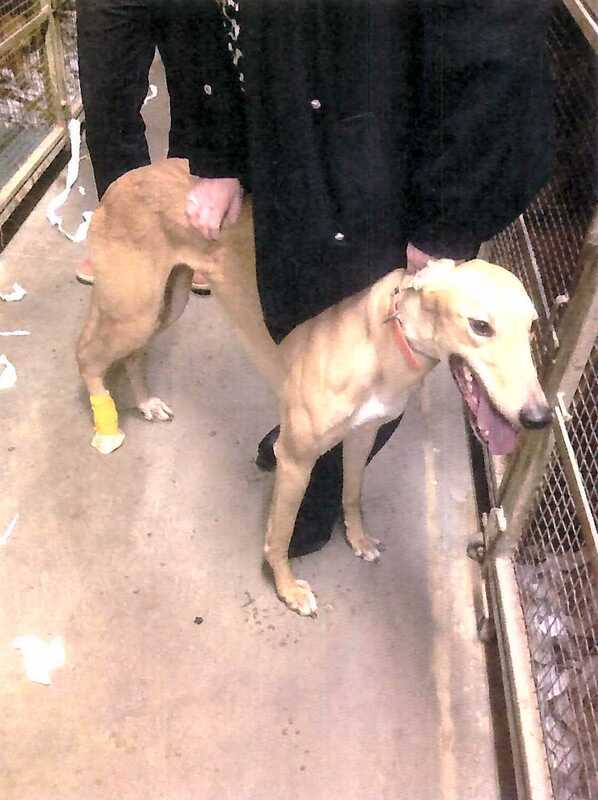 A few weeks ago I wrote about Kiowa Dutch Girl, a two-year-old red fawn greyhound who was denied veterinary care after suffering a broken leg at Wheeling Island dog track in West Virginia. Since then, we have received additional state records about Dutch Girl. These documents raise new questions, and also highlight the role of a state veterinarian in saving the greyhound's life. According to an official state Record of Incident, West Virginia Racing Commission veterinarian Dr. Lori Bohenko visited the Cardinal Kennel on March 8 to check on Dutch Girl. The day before, state regulators had directed the kennel's owner to immediately transport the dog to a veterinary clinic so she could receive treatment. By that point, Dutch Girl had already suffered for at least three days with an untreated broken leg. "James Grace greeted me and when I asked him 'what he knew' he responded by telling me that the dog was at K.E.Y. Animal Hospital and it looked like she would was going to be euthanized. I instructed him to call the clinic immediately and inform them not to euthanize 'Kiowa Dutch Girl.' As Jim was on the phone, I entered the kennel to look for 'Girl' and found that her crate was empty." "I then asked him why he didn't contact me and ask for help in stabilizing the dog. He had no answer." "Since Mr. Mackey had been informed by State Presiding Judge to transport 'Kiowa Dutch Girl' to a veterinary hospital immediately on Thursday, March 7, 2013 he is in violation of West Virginia Rules of Greyhound Racing as outlined below." Despite this violation outlined by Dr. Bohenko, we have found absolutely no evidence that any disciplinary action was taken against Mackey. Further, we have received no indication that Grace has been referred to local law enforcement officials for possible prosecution under the anti-cruelty law. This sad case raises many important questions about how dog racing is regulated in West Virginia. As we move forward and address these issues, one thing is certain: Dr. Lori Bohenko saved the life of Kiowa Dutch Girl. For that, greyhound advocates across the country should be thankful. He should be prosecuted to the full extent aof the law. Greyhound racing should be shut down completely, the only thing these people care about is how much money they can make. Greyhounds are the most sweet and loving dogs on this planet. I was lucky to be owned by one for 9 years I lost him to cancer. I would have given up my own life for my best friend. As of September 24th it will be 7 years and I still cry. It makes me sick to see the horros these beautiful animlas are put thru! Thank you Dr. Lori Bohenko! You are a great American heroine! Poor girl. Glad she got help. I cannot believe greyhound racing is still going on. Just rescued my girl, Derby, last week-- she is two years old and recently was rescued from a track in Corpus Christi. I can't believe my baby did that! It is so dangerous and traumatizing. She is afraid of everyone (mostly men). I am the first person to ever show her love, and I wouldn't have it any other way. I hope Dutch Girl finds her human, too.